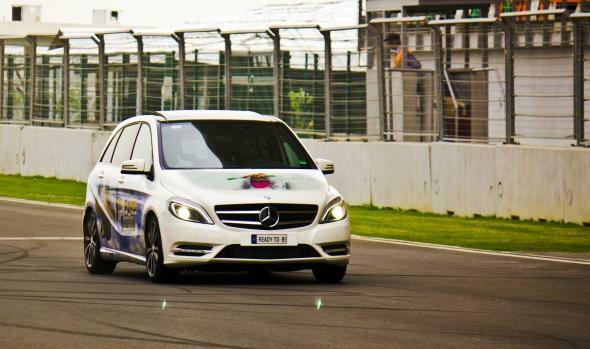 Mercedes Benz B-Class launched at Rs.21.49 lakh! Mercedes Benz has launched the B-Class sports tourer in India priced at 21.49 lakh for the B180 variant and 24.87 lakh for the B180 Sport (ex-showroom Mumbai). The B-Class is essentially a multi-purpose vehicle than a large hatchback and is the lowest-priced Mercedes model in India. The B-Class is positioned directly against the BMW X1 and the Audi Q3. It also has a large 486 litre boot and this boot space can further be increased to 1,545 litres by folding the rear seats. The only difference between B180 and B180 Sport are the tyres. The B180 comes with 205/55/16 tyres and the B180 Sport runs on 225/45/17 tyres. It has an ARAI claimed mileage of 14.8 kmpl and a turning radius of 5.5-metres. It feels like a large hatchback in the way it handles and there is noticeable body roll. But safety features like traction control and intelligent ABS kick in quickly enough to keep things in check. The B-Class is loaded with safety features like seven airbags, ABS, collision prevention assist, attention assist (a coffee-cup icon that lights up if you are tired) and seat-belt pre-tensioners. The top of the line variants of the B-Class will get a panoramic sun-roof. It also has a central infotainment system with a “command” control system, that gives you access to the entertainment system and phone functionality, with a pop-up screen on the dashboard. The B-Class will attract buyers who want a lifestyle vehicle and do not mind shelling out 2o odd lakhs on a MPV which Mercedes calls the Sports tourer.